PNW District... Third Quarter Meeting...May 21-22, 2010...It was a busy weekend. I think every time we come together for a quarterly meeting it is busy because we have so much to cover and we have traveled so far to do so with such little time. Some districts struggle to get a recommended quorum at their meetings and I am proud to say that is not a challenge that we have had this year. And for that, I have to thank the wonderful commitment of our Optimist Club presidents and secretary-treasurers. Thank you for understanding how district meetings help make your club more vibrant at home. Thank you for sharing your optimism. The PNW District finals of the Optimist International Oratorical Contest - With eight contestants from our four regions, our top finishers winning $2,500, $1,500 and $1,000 respectively were Noel Lai, Vancouver BC, Selin Jessa, Coquitlam BC, and Jessica Glaser, Scio, OR. The PNW District Communications Contest for the Deaf and Hard of Hearing (CCDHH) - In an effort to make the contest more accessible to all clubs in the district, we held the CCDHH contest during our district meeting. Three contestants from the Tucker-Maxon School, sponsored by the Portland NE Optimist Club, competed with Anastasia Zyhtaryuk winning a $2,500 scholarship. Rebecca Sanford and Zach Little placed second and third. The PNW District Essay winner was revealed to be Allison Farrell, 14, representing the Hillsboro Optimist Club. The District Board of Directors reviewed, debated and passed a new policy that limits fundraising at district meetings to the Optimist International Foundations, Childhood Cancer Campaign, and District fundraising events as approved by Optimist International. We heard reports from Committee Chairs with a special emphasis on the District Qualifiers for the Optimist Junior Golf Championships. The Canada qualifier was taking place at the same time as our district meeting. The US Qualifier will be held June 21, 2010. Every club may sponsor junior golfers to play. Golfers may also enter at large. Click here for more information. International Convention Ambassador Al Kersey encouraged newly elected club presidents to attend the International Convention with a special emphasis on the hospitality and learning provided to attendees. Click here for more information. 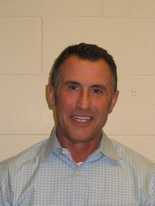 Ed Murphy III, Governor-elect announced that the zone alignment would remain the same in 2010-11 and the election of lt. governors-elect took place. Congratulations and thanks to the following Optimist Club members for agreeing to serve: Zone 3 - Ellen Julian, Zone 5 - Renee Wallace, Zone 6 - John Chamberlain, Zone 7 - Larry Blackburn, Zone 9 - Don Bohrn, and Zone 10 - Charlie Kissler. Clubs were encouraged to submit their officer-elect reports and strive to be an Honor Club. That distinction is within reach for every club in the district. Lorraine Coots, Membership Chair recognized every member who had brought in two or more members this year and then went on to make presentations to those who have done just a little more including: Larry Blackburn, Caldwell Optimist Club - 4 members; Dora Gulvin, Sandy Optimist Club - 5 members; and Jared Lowell, Lebanon Optimist Club - 6 members. Linda Jackson, Governor, recognized the clubs that were currently submitting their club bulletins to the communications team. Noting that writing a weekly bulletin was hard, she also gave recognition to Donna Bohrn for the personality that she adds to the Twin Falls Blab. Find out how to submit your bulletin and read the latest editions by clicking here. Angie Bridge, Bulletin Editor and good will ambassador made it easy for all of our first-timers to be involved. Scott Keller, President, Portland NE Optimist Club facilitated a relationship building session to help clubs identify how to engage with their communities. Gay Enyeart, Leadership Development Chair led a panel of past district secretary/treasurers to help us learn how to step-up to leadership and how to let go. Governor Linda Jackson brought the opening session to a close with the video from the Jerome Optimist Club Easter Egg Hunt. Held this year in freezing temperatures, blowing winds, and snow, the video reminds us what Optimist Club service is all about. 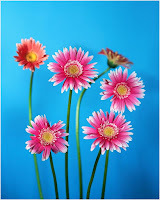 As I wrote this post, I thought of so many other things that happened during the weekend. People that should be recognized and the people who weren't there and I missed seeing. You really owe it to yourself and your Optimist Club to come to our District meetings. They are busy, but you choose what you want to do. My bet is you will choose to do it all. Thank you so much to Shirley Hilts, Lt. Governor, Zone 6 and all of the clubs, chairmen and committees that made this weekend special. Thank you especially to the students, parents and Optimist Clubs and members that took part. You ignite my optimism. Really, you do. It was a rainy day in the Portland area today, but that didn't stop the Beaverton Optimist Club from hosting a booth at the Farmer's Market. According to Lt. Governor Alan Zehntbauer, they sold cinnamon rolls and soda pop and made a little money. 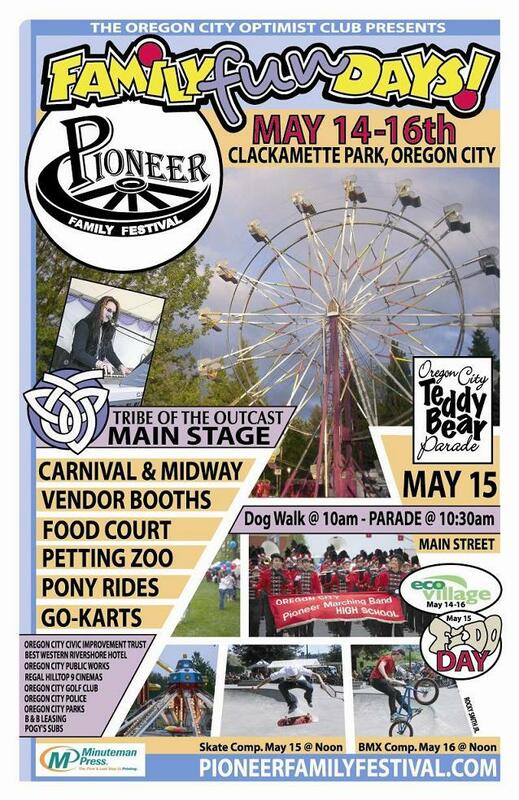 Best of all, they got the word out about the Beaverton Optimist Club with custom designed membership brochures. What a great way to let your community know about what you do. The Meridian Optimist Club is home to a Junior Rifle shooting program. One of the standout marksmen, Mitchell Van Patten was recently honored by Boise news station Channel 6 as the Athlete of the Week. Mitchell has been shooting competitively for almost four years. They just kept coming! As the Pacific Northwest District Optimist Oratorical Contest was set to start at 9:00 a.m. on Saturday, May 22, we had to delay just a few minutes to add more seats to the venue. The room was set for 120 guests and 11 contestants. According to Ed DeSantis, acting sergeant-at-arms for the contest, they were pulling chairs from the room next door when the hotel staff arrived with twenty more seats. What a great problem to solve," remarked Linda Jackson, Governor. We had expected just over 100 Optimist Club members plus the parents of the contestants or about 120 people. It was exciting to see others, people from the Newport community, come out to hear the thoughts of our students." 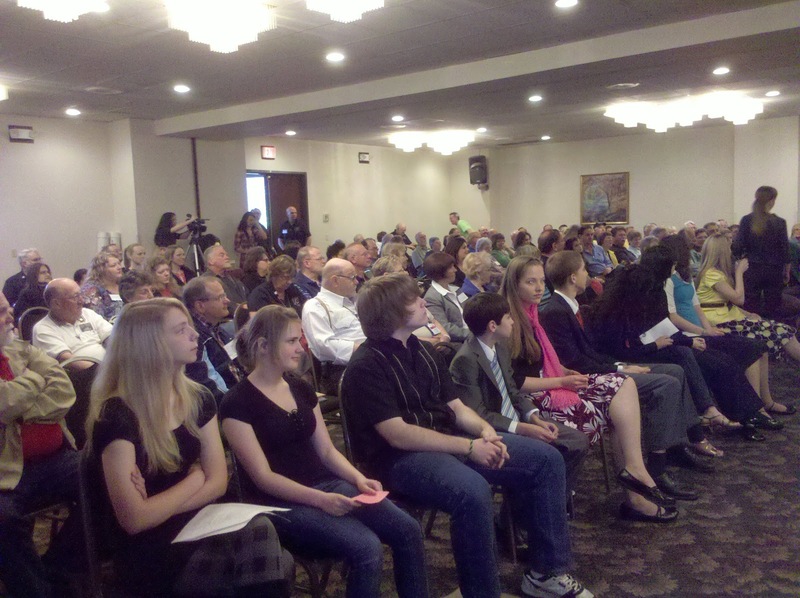 A little over 150 people enjoyed the speeches of the young contestants. All contestants under 16 years of age spoke on the topic "Cyber Communications: Progress or Problem?" Eight students were part of the traditional oratorical contest for the PNW District and three competed in the Communications Contest for the Deaf and Hard of Hearing (CCDHH). They vied for two first-place scholarships of $2,500. In the traditional oratorical contest, they also earned scholarships of $1,500 and $1,000 for second and third place. The winners were not yet announced when this post was made. Please check back soon to find out more. What do Christmas trees have to do with high school graduation? For the Portland-Peninsula Optimist Club, a lot! A Christmas Tree lot to be exact. 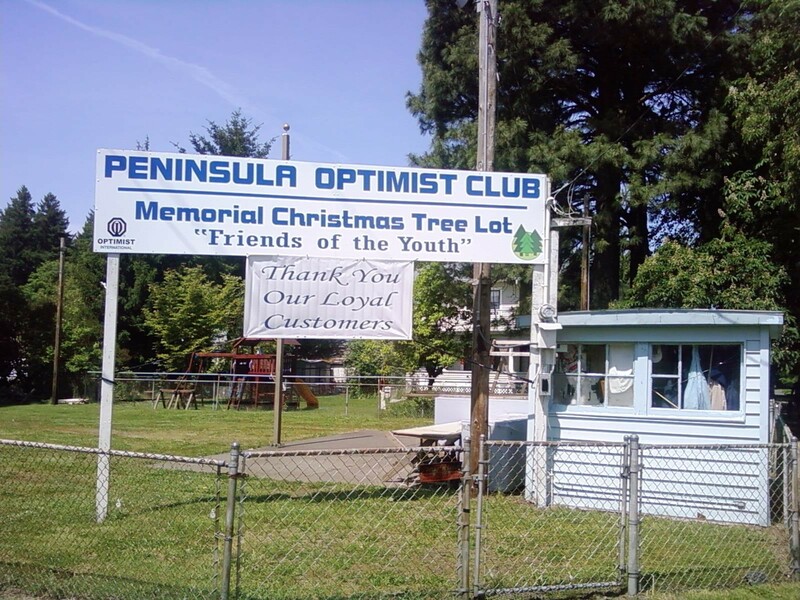 For 46 years the Portland-Peninsula Optimist Club has provided scholarships for students at Roosevelt High School who will attend community college or vocational schools after graduation. Those scholarships are made possible by the Christmas tree sales held every year by the Portland-Peninsula Optimist Club. In the week before Independence Day, the tree lot becomes a fireworks stand and helps the club contribute even more back to the community. According to Reverand Bill Van Nostran, President, the Optimists who are comprised of individuals from all occupations of life have given over $475,000 to youth groups in North Portland. Additionally, with high regard for continuing education, members have individually donated and the club has matched more than $275,000 to the Theodore Roosevelt Women's Association and the Mary Mock Family Scholarship which award a scholarship to a girl and boy respectively each year. President Van Nostran concludes, "As Optimists we believe that our history of over sixty years, our constant work and effort and our commitment to youth have entitled us to display proudly our sign at N. Lombard and N. Chautauqua: Friends of the Youth." The Portland-Peninsula Optimist Club of Oregon was chartered in 1946. Thanks to the Portland Peninsula Optimist Club for sharing their story with Lt. Governor Alan Zehntbauer and Leadership Development Chair Gay Enyeart. Earlier this month, the Gresham Optimist Club recognized outstanding police officers at the Annual Respect for Law Banquet. Fifty-five people were on hand to honor the Respect for Law Officers from Fairview, Gresham, Portland and Troutdale. John Pemberton from Fairview, David Schmidt from Gresham, Treavis Law from Portland and Matt Jordan from Troutdale were honored this year. The program was held at the Spaghetti Factory in Clackamas and organized by Fred and Teresa Wallace and Jim Slauson. Thanks to Jean Jensen, Gresham Optigraph Editor for the picture and story. 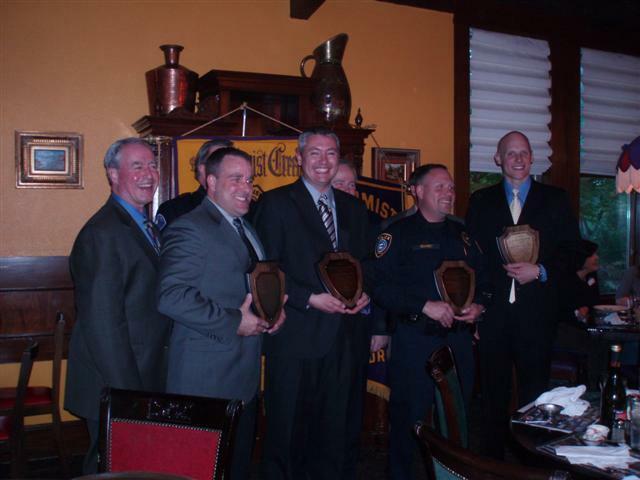 The Oregon City Optimist Club honored Police Chief Mike Conrad with the 2010 Optimist Award for Excellence in Law Enforcement. Conrad was appointed chief of police a little over one year ago. He has served on the Oregon City police force for 6 years. The Optimist Club bestows this honor annually to police officers who effectively promote public safety for the community and citizens of Oregon City. The Mission Optimist Club is proud to announce the Mission Optimist Club Mother of the Year is Paula Steeg. Paula is shown here (left) with her daughters Kailee and Alexis and Optimist Club president Trish Raw. The honor was given to Paula based on an essay written by Alexis about her mom. Alexis is a seventh grade student at Cherry Hill Elementary School. 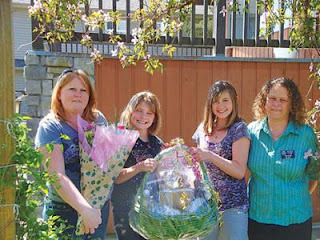 In addition to the gift basket filled with goods and services from local merchants, she also won $1,000 for the Cherry Hill Parent Advisory Committee. 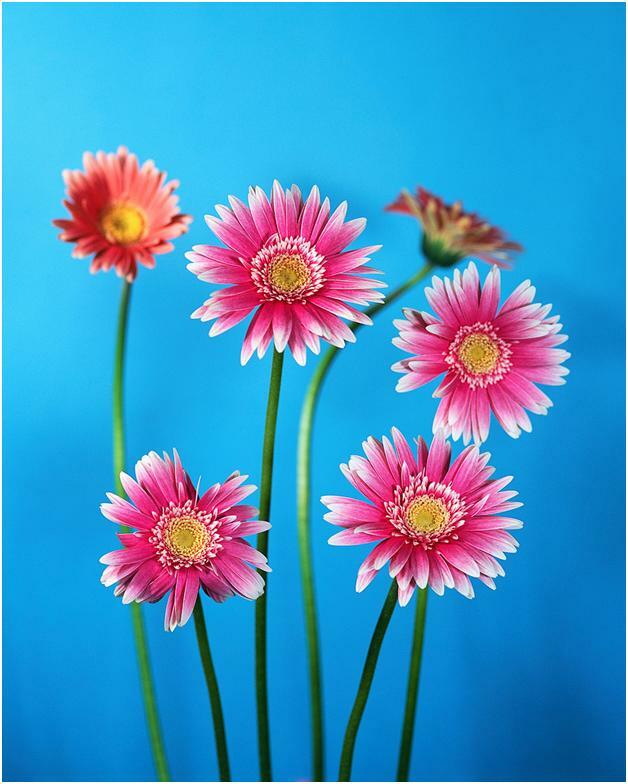 I'm taking one of those moments to say thank you to all of the mothers, grandmothers, and friends who through their caring actions seem like mothers to others. You are all the best. Governor Linda Jackson and Leadership Development Chair Gay Enyeart visited the Beaverton Optimist Club on May 6 where they were treated to breakfast and warm hospitality by Alan Zehntbauer, Lt. 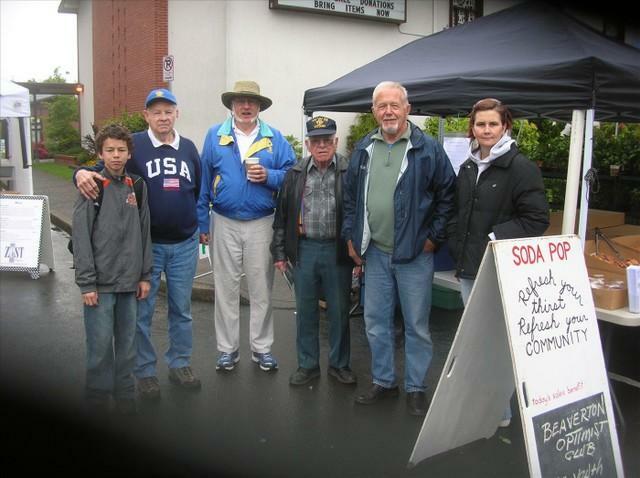 Governor, Zone 4 and the members of the Beaverton Optimist Club. Alan was quick to follow-up with pictures and the club bulletin, the Beabull recording the event. Enjoy! Last month Benny Ellerbe, Executive Director, Optimist International informed Optimist Clubs that the organization will remain under the IRS designation 501 (c) (4) reserved for social welfare organizations. In order to comply with IRS guidelines, all Optimist Clubs must adjust their bylaws. Thanks to the online system at Optimist Leaders, this is a very simple process. Please review this tutorial before you start. The Optimist International Member Services Department may be reached at 1-800-500-8130. One of the reasons that Optimist International holds an annual meeting is to allow Optimist Clubs to have a say in the governance of the organization. That includes electing persons to the International Board of Directors, the office of International Vice President and voting on amendments to the organization's bylaws. Voting rules, candidates and issues may be found in the May edition of The Hotline. Read The Hotline here. Among the issues are proposed amendments that look at dues restructuring to allow lower fees for active military personnel and college students and annual dues payments for clubs consistently on the 120-day list. There is also an amendment proposed to facilitate the administration of the districts should not enough clubs attend the Parallel District Conferences being conducted in the first quarter of the 2010-2011 administrative year by all regions except for the West Region. The Optimist International Convention will take place in Denver, Colorado, July 9-11, 2010. It's a convenient location for our district and with a shorter agenda than usual, PNW Optimist Clubs should be able to save money yet still participate in this annual act of unity. Find out more about the international convention here. Report your new club officers by May 20 and win! What's happening right now in Optimist Clubs around the world? New club officer elections! While it may seem early to elect officers that won't officially take office until October 1, consider the benefits of having your current and future officers working together to accomplish the goals of your Optimist Club. More enthusiasm leads to more involvement. Short and long term goals can coexist. There are more team members to offer more skills. More hands make light work. Optimist International encourages early elections so new officers can go to the International Convention for their specially designed training. Optimist districts like early elections for the same reason. Hopefully, Optimist Clubs understand the value of teamwork and continuity and seek to get more people involved so they can share their projects, dreams, and attitude with all. Report your new officers now and win! Please hold your Optimist Club elections and report them before May 20 to Optimist International and your newly elected president and secretary/treasurer will be entered into a drawing for free conference registration to the PNW District Convention, a $115 value, on August 19-21, 2010. This prize is not transferable and must be used by the person whose name is drawn. Please log in as Club President or S/T. Choose REPORTS from the side menu. From the REPORTS menu choose CLUB OFFICER-ELECT REPORT, complete all blanks and choose SUBMIT. Your information will then be available to all district leaders. Thank you!